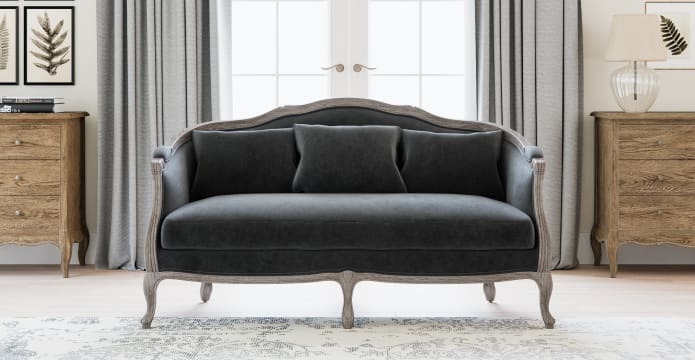 The classic French Provincial design gets a modern update in the Lucy 3 Seater Sofa. With its timeless shape and cabriole legs, this stunning piece will add character and sophistication to any space. The Lucy 3 Seater provides the perfect area for conversation or to enjoy a cup of tea with plenty of room for friends to settle in comfortably. Pair it with two accent chairs for matching room decor or use as a standalone piece to make a style statement. No detail is left unturned in the high quality craftsmanship of the elegant Lucy 3 Seater. Featuring solid oak construction with scalloped and scrolled wood trim in a beautiful distressed finish provides the perfect blend of comfort and style. Create a stand out piece or blend into your existing palette with 10 different colours, from Warwick Fabrics Mystere Velvet range, to fit your interior style. The soft texture of the natural feeling fabric brings a romantic flair that will add to any traditional or transitional room. I was desperately searching for classic furniture, and could not find anything in-store in Brisbane. Then, I saw Brosa online advertisement, and hopelessly looked through it. See, touch and feel our fabrics used on our Lucy 3 Seater Sofa. For Free! Simply select up to 3 fabrics and add them to your cart. Delivery is on us.